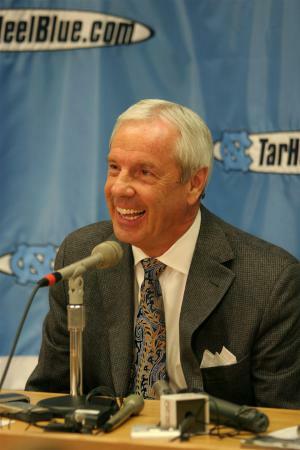 Roy Williams was born on the 1st August 1950, in Marion, North Carolina USA, and is perhaps best known for being a college basketball coach, particular as the head coach of University of North Carolina, and the University of Kansas. He is considered to be one of the greatest college basketball coaches in the world. His career has been active since 1973. Have you ever wondered how rich Roy Williams is, as of mid- 2016? According to authoritative sources, it has been estimated that the total size of Roy’s net worth is over $12 million, which has been accumulated through his successful career in the sports industry. Roy Williams spent his childhood divided between Marion, his hometown, and Spruce Pine cities, both in North Carolina. Later, he moved with his family to Asheville, where he attended T. C. Roberson High School. While there, he began playing basketball and baseball, excelling at the former, and being named to the All-Country team in 1967 and 1968, and later he was a captain in the North Carolina Blue-White All-Star Game. After matriculation, he enrolled at the University of North Carolina at Chapel Hill, where he played basketball. While there, he also began to learn about the game off the court, under the guidance of Dean Smith. After he finished his college education, Roy sought employment as basketball coach, and was appointed as high school basketball and golf coach at Charles D. Owens High School. He worked there for five years, before in 1978 returning to the University of North Carolina as an assistant coach to the already mentioned Dean Smith. He stayed there for the next 10 seasons, learning further about the coaching job, and while there he was the one responsible for recruiting legendary player Michael Jordan to the University. Roy left North Carolina in 1988, and was appointed as the head coach of the University of Kansas Jayhawks. He stayed in that position for 15 years, leading Kansas to some of its most successful seasons, winning three Big 12 Tournament Championships, in 1997, 1998, and 1999. Furthermore, he and his team won the Big 12 Regular Season Championships in 1997, 1998, 2002 and 2003. During his time at Kansas, Roy`s net worth increased by a large margin, but what was more important, his name became well known in basketball. However, in 2003 he accepted the offer from his native University of North Carolina, and since then has been the coach of the men`s basketball team, winning the NCAA championship in his second year with the team. Four years later came his second championship, and apart from which Roy has won several more titles with Carolina, including ACC Tournament Championships in 2007, 2008 and 2016, and he also the ACC Regular Season Championships in 2005, 2007, 2008, 2009, 2011, 2012, and 2016. Thanks to his skills, Roy has won several awards on his own, including AP Coach of the Year in 1992 and 1996, ACC Coach of the Year 2006 and 2011. Furthermore, he won Naismith College Coach of the Year award in 1997, and John R. Wooden Legends of Coaching Award in 2003. Roy was inducted into the Basketball Hall Of Fame in 2007, and the College Basketball Hall Of Fame in 2006, crowns on his long and successful coaching career. Speaking about his personal life, Roy Williams has been married to Wanda Williams since 1973, and the couple has two children. In free time, he is very active in charities with his wife. In 2009, a biographical book named “Hard Work: A Life On And Off The Court”, was released, written by Tim Crothers.